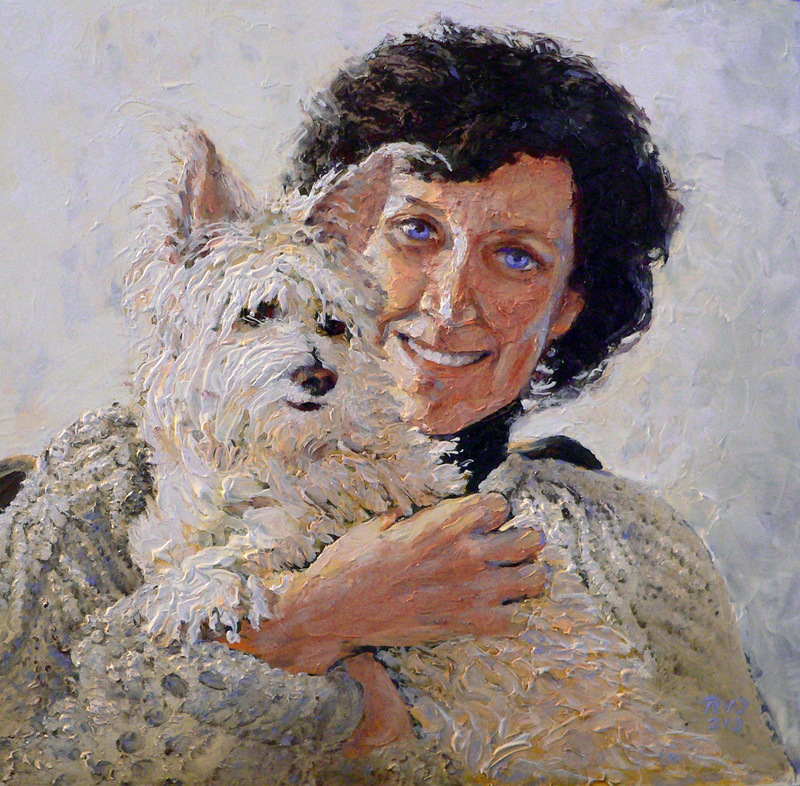 This is a portrait in oils that I just finished of Nancy and Tinker. Nancy is the love of my life, a lifelong friend, and my wife. Everyone who knows Nancy loves her. They can’t help it, she is just that kind of person. She radiates compassion for all beings…especially the four-legged variety. She is holding Tinker, our wonder terrier, in her arms. Dearest Nancy, I love you, and although we Quakers do not swear oaths, I have in mind this faithfully devoted commitment to you until death does part us. That is a wonderful portrait. Nancy’s eyes light up her whole being. She is very compassionate and you two are perfect soul-mates. Her love for animals, humans and the planet are so inspiring. Happy Anniversary and Happy Valentine’s Day to you both. I feel deeply blessed to have you both in my life. Thank you all for your loving sentiment. I think that Valentine’s day should be a celebration of all the different types of love. Romantic, familial, brotherly, etc…why exclude anyone from this celebration. To quote John Woolman, “let love be the first motion”. Also thank you all for making this the most viewed post on “This Speaks My Mind” to date! This is an absolutely beautiful portrait, Roger. What a wonderful expression of love! You have truly captured Nancy’s jeux de vivre and her love for Tinker (as well as for the artist, of course). Happy anniversary to both of you!! #1 HAPPY ANNIVERSARY! / FELIZ ANIVERSARIO!! #2 Beautiful painting and sentiment! #3 Roger? Really? Publicly sentimental? #4 Knowing the subject matter[s] first hand I see why. My dear Roger you continue to be an inspiration to me. – There’s no word in common use that can be used to describe a wife who is similarly fond of her husband. The only candidate is the invented word maritorious, from the Latin word for a husband, maritus. But it’s extremely rare: the 20-volume historical Oxford English Dictionary has only two examples, one from 1607 and one from 1978.